By that very fact that Jesus came into the world, a completely new age broke forth. It came with Him, and it came by Him. One can truly talk about before and after Christ. And then not just to be able to gauge the time up against something (an historical event), but it implied a totally different age as God also had predicted by prophets. An age when the Spirit of God should be poured out over all people, regardless of class and position. (Joel 3). The barrier - the animosity - between God and human beings because of the sin, should be torn down - a fountain to purification from sin and impurity, should be opened. (Zech. 13:1). And like this i.a. speaks The Lord about it in the old covenants age: "Behold, I will do something new, Now it will spring forth; Will you not be aware of it? (Is. 43:19a). Note! - because it says everything about this new age - who that is the acting one here. Two things here - it talks about something new, i.e. something that was not before, and He is the one who does it. It is not anything you somehow shall manage, but it shall germinate. It shall accordingly grow up for us. We do not have to "manure" it with our own doings. It is coming to the world by itself, as we see in this verse in the prophet Isaiah among many others, and by itself it grows and is bearing fruit in the believers’ heart and life. (Mark 4:26-28). A totally new age! A totally different age! But this is not anything mystical, anything vague, but God has attached it to something absolutely certain and concrete. A person! About that e.g. preaches Paul to the Athenians on Mars hill so: "Therefore having overlooked the times of ignorance, God is now declaring to men that all people everywhere should repent, because He has fixed a day in which He will judge the world in righteousness through a Man whom He has appointed, having furnished proof to all men by raising Him from the dead." (Acts. 17:30-31). This person has in the Old Testament, by the prophets Isaiah and Jeremiah, also got precisely the name Branch (Norw. transl. “Sprout”). (Is. 4:2 and Jer. 23:5). By Him shall everything happen and in Him shall everything be given unto us for free. Like God in the beginning created everything by Him, He also creates (gives rebirth to) everything by Him, so that it is called: “But if anyone does not have the Spirit of Christ, he does not belong to Him." (Rom. 8:9). And Jesus Himself says: ”No one comes to the Father but through Me." (John 14:6). He is accordingly the one by whom the Father restores everything - also our relationship towards Him, as He in Him gives us the right to be His sons. The Scripture testifies about this, and says: “If anyone is in Christ, he is a new creature." (2 Cor. 5:17). Not in yourself, but in Christ! This you are allowed to believe, you who in the agony your sin has brought you, have had to take your refuge to Jesus, by the testimony (the Word) about Him: “The old things passed away; behold, new things have come." (2 Cor. 5, 17). It has also become a totally new way of living - namely in faith - trusting to Him, and Gods words testimony about Him and His act for us, in past, present and all future. His perfect life accordant with Gods holy Law i.e. 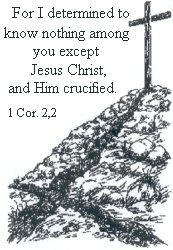 His perfect fulfilment of the Law, and His death on the cross because of our sin. He who vouched for you before God before you were born into this world - vouches for you now, and will do it for all future! Certainly, we can truly talk about a completely new age! Then we see - and hopefully hear - Jesus stands here and cries out to the Jews, in the midst of their religious rituals, efforts and sacrifices: “If anyone is thirsty, let him come to Me and drink! (v.37). What shall you drink? You shall drink His act and His blood that is poured out to forgiveness of sins, for you. In other words simply His person, which certainly not can be separated from His act. He is God’s act for you, and you do not need anything more. Not for the life you shall come to live as a Christian, in this world either. Oh, so much struggle there is among us - as if it had not happened something new! Listen to what Jesus says about Christian life here: ”From his innermost being will flow rivers of living water." (v.38b). This shall you achieve? No! "- this He spoke of the Spirit, whom those who believed in Him were to receive!" (v.39). And He attaches it to one sole thing: “- those who believed in Him.” (v.38a). But, what shall I do? says many. You shall thank Him for this unbelievable gift that everything is done! But isn‘t it written something about that we shall do good doings, even with eagerness? The whole Script, and also Jesus‘ own preaching contains certainly admonishments too! Man knows almost no limits when it comes to dodge to get round this, that God is so good that He has given us everything for free. It becomes, so to speak, so unreasonable this, for our mind and sense. We think He must be like us and give according to what we deserve. But what end would it be, if we should get what we deserved? Would that hold to heaven and beatitude? Would that hold to fellowship and familiarity with the three times holy God? Certainly, whoever may believe something like that, will one day get a terrible surprise! God is not unfair so He should give us something we haven't deserved. It would be against His righteousness and holiness to do so, but in His love He found a way for us: He deserved it in our place! Jesus counts in my place! That is His Word to me now. Your salvation stands and falls with what Jesus did, if it is enough before the throne of God. And then you can certainly ask: How certain can he be, who has taken his refuge to Jesus, when it comes to his salvation? What about the doings then? - The admonishment? - Yes, what about them? What have they with this to do? Speak about your doings, they are not considered at all - if they had - you would thereby be lost! Not even the results of Gods‘ grace - the fruit of the Spirit - which Jesus speaks about here - comes in consideration what concerns your salvation. This will indeed, on the last day, show (God sees it) if you had the belief in the vicarious Jesus - but it is only the vicarious Jesus Himself who is your salvation. Here is, and has always been, a great confusion about just this, and it seems in the light of the Scripture’s testimony that it will become notably great in the last days. See e.g. Jesus‘ statement about the coming of the Son of Man: “However, when the Son of Man comes, will He find faith (“the faith” Norw. transl.) on the earth?" (Luke 18:8). But Note! what it is called, and it will help you see: "The results of Gods‘ grace.” It has accordingly that clear assumption that the grace already is on hand and reigns. (Rom. 5:21). And further: "The fruit of the Spirit." The Spirit that you get you who believes in Him. (v.39). The message of salvation itself - the message you are saved by - is certainly the actual assumption for this! You must already be saved if there shall be any results of Gods‘ grace - the grace cannot work anything where it does not reign. - And you must already be saved and have received the Spirit if there shall be any fruit of the Spirit. "This He spoke of the Spirit, whom those who believed in Him were to receive." (v.39). Do we need to get it explained that thoroughly?" Yes, really! When it comes to this we must be fed like babies, because - as it shows - this is difficult to discern, keep apart, and hold firm in practice. And it is precisely here the actual spiritual fight is going on, also today - as always. Without this light, there is no God’s congregation, but only people's congregations. That serious, and that vital, is this issue. It is accordingly neither these “the Spirit’s flowing rivers of living water” you shall get taken up with - it is a great many, who have gone astray by that - but to come to Jesus to drink! Jesus gives us light about such things - not so that we, as it so often happens, shall get taken up with these things, but so that we shall find rest, in the certainty that whoever comes to Him has these things, and shall thereby be let off to worry about it.